EXCLUSIVE Celebrate the moment their little one’s hands stole their heart with our sweet new keepsake. 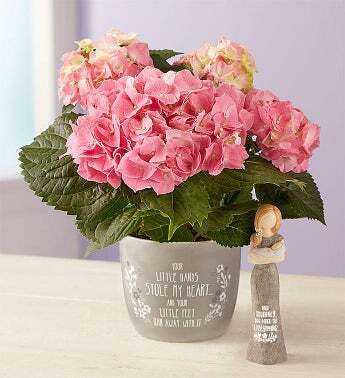 A bright and blooming hydrangea arrives inside our stylish grey ceramic container, featuring a heartwarming sentiment and floral design in front and butterfly in back. Available in pink, blue or white, this thoughtful surprise is a symbol of the love blossoming in their heart and home. Add to your gift with our lovely collectible statue of a new mom holding her child, a touching reminder of their special bond.